The construction of a new airport at Gerald's Bottom financed jointly by the EU and DFID consisting of a 600 metres long runway able to accommodate twin otter aircraft and an apron with a surface of 70,000 sq. metres. The design and construction of the replacement airport at Gerald’s required the construction & equipping of a new air traffic control tower and full equipment, navaids, AGL & telecommunications, fire and rescue; all designed, specified & supervised by the consultant. a taxiway to simultaneously accommodate two Twin Otter-type aircraft. an aircraft parking apron to simultaneously accommodate two Twin Otter-type aircraft with power in or power out operations. A terminal building with car park. The new runway, taxiway and apron were constructed on a green field site. All materials were reduced spacing of the geotextile reinforcement. 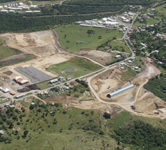 To preserve access for further resettlement of the island, and to ensure that the airport did not sever the community, a tunnel beneath the runway was included in the package..
Extensive drainage and interception facilities were included in the works in order to control erosion and the adverse effects of such on runoff, and oil/fuel contamination. The new runway at sits across a topographic ridge. The length of the runway required to allow the desired aircraft types to land was longer than the width of the ridge. It was therefore necessary to extend to the runaway at each end, notably the west end. Due to the steep sides of the ridge 45o reinforced slope embankment was construction – the vertical height of the embankment was some 30m. The design of the embankment had to include seismic acceleration and required significant lengths and reduced spacing of the geotextile reinforcement.